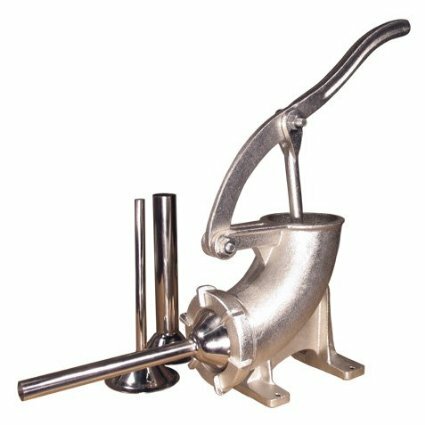 3 LB Sausage Stuffer Includes a set of 3 stainless steel stuffing tubes, 10mm for snack sticks, 20mm for bratwurst pepperonis and a 30mm for summer sausage and luncheon meats. Rubber gasket prevents meat from leaking around the plunger. Ergonomic handle for greater leverage and easy stuffing. Mounts easily to any counter or tabletop. Disassembles for easy clean-up Not a stock item. Please allow extra time for delivery.